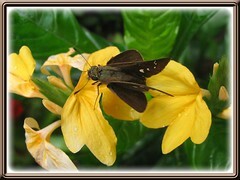 This attractive dark-brown skipper butterfly seems to love visiting our urban home-garden. It is seen so frequently flitting from bloom to bloom that I was never in a haste to capture its image knowing that I will never run out of photo opportunity. Lerema accius is a medium-sized skipper butterfly with a stout hairy body, possessing large black eyes resembling gem stones and bent antennae clubs. Wings are dark brown that span 3.2-4.5 cm wide. The upperside of the male’s forewing has a dark black stigma, and with lesser white spots than the female, whose spots are larger and transparent. There is a row of 3 small white spots on the costa of the forewing and several more larger ones (3-4 on the female, whereas one on the male) lower down the centre, on both the upper and under surfaces. The hindwing, on the other hand, is unmarked on both surfaces, and has dark and light patches (greyish-brown) on the underside. Sometimes, the underside edges of both pair of wings can show a purple tint. 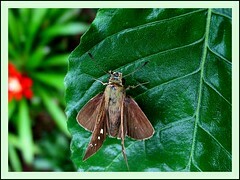 As characteristic of most skippers, Clouded Skipper has a fast skipping flight and a typical basking posture in which the forewings are held at a 45-degree angle while the hindwings are fully spread. Range: Wide area of the southern half and southeast of the United States, extending south to Mexico and northern South America. Having seen in Malaysia too, I wonder how far it has travelled in the Oriental regions? Habitat: Forest edges and clearings near rivers and swamps, as well as grassy areas around woods and woodland clearings. Even found in home gardens and urban parks. Food: Caterpillar feeds on the grasses of many species, while the adult are attracted to various flowers, colored pink, purple, white or yellow, such as Buttonbush, Lantana and Crossandra. 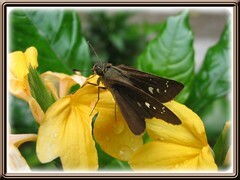 External link: Check from Mountain Prairie Information Node for range map and more information on Clouded Skipper.